Peanuuut peanut butter and jelly and jelly! Studies show early exposure to peanut can decrease the likeliness of developing an allergy. Peanut allergy in children living in western countries has greatly increased over the past decade. In the United States alone the amount of children dealing with the allergy problem rose from 1.4 percent in 2010 from 0.4 percent in 1997, according to a study made at Mount Sinai Hospital in New York. Yet, western countries are not alone in this peanut allergy struggle; the allergy is becoming evident in both african and asian continents. What once was considered a problem solely for western countries is now becoming a complication for many developing nations. Exposure of peanut-based foods to the allergy carrier could possibly lead to an intense allergic reaction, also known as anaphylaxis, which could be fatal. There have been over 120-recorded deaths from anaphylaxis in the United States since 1986. So far, the only accurate prescription doctors can give to patients with this allergy is strict-avoidance of the food which can be exceedingly be difficult in a world where peanuts are used in hundreds of different foods and food products. However, according to a study conducted by researchers at The King’s College London University, the earlier exposure an infant has to peanuts and peanut-products, the greater chance the infant has of not acquiring an allergy to the food. Based on the study published in The New England Journal of Medicine, a group of 640 infants, who were determined likely to soon develop peanut allergies by the researchers, were fed certain diets either entirely without peanut products or that included the progressive addition of peanut-based foods before the child turned one year of age. 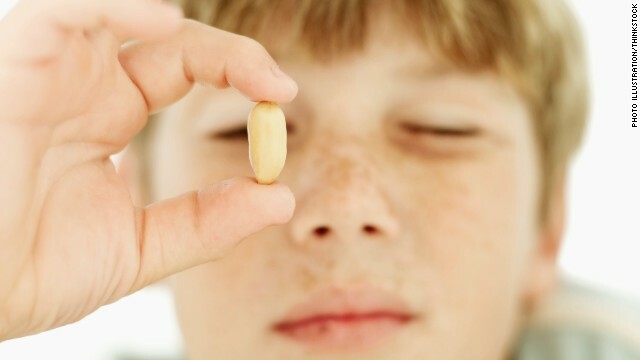 After five years of studying how the children’s bodies reacted to the food with the allergen, the result was 17% of the infants on strict no-peanut diets went on to develop the allergy, while a mere 3.2 percent of the ones who did eat peanuts had the same complications. Researchers curiously found that peanut allergy was 10 times higher among Jewish children living in the United Kingdom, then children from the same ancestry living in Israel. This correlated with the time at which peanuts are introduced in a child’s diet in these countries. In the United Kingdom, infants do not normally eat foods with peanuts during the first year of their life, while in Israel; peanut-based foods are given to infants at roughly 7 months of age. This finding further helped them conclude that early exposure is key to prevention in some cases. The lead researcher plans on continuing his study to determine whether children need to continue to eat peanut products in order to maintain a tolerance towards the allergy. He plans to study the children that were most likely to develop the allergy but did not as a result of early exposure, and see if the allergy would begin if these children were to stop consuming peanuts altogether.